Royal Civil Service Silver Medal Award for his 20 or more years of dedicated service to the tsa-wa-sum. 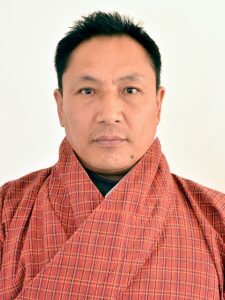 Returning Officer, National Council and National Assembly Elections for the First Parliament of Bhutan in 2007 and 2008. Academic Board (Programs & Quality Committee member), Royal University of Bhutan from 2007 to 2010. Member of National IT Task Force: Development of IT Strategy for Bhutan, leading to the introduction of the Internet into the country in 1999 and 2000. Task Force Report (2003).Information and Communications Technology (ICT) Policy for Bhutan – A White Paper. Thimphu, Ministry of Information and Communications, RGoB. Nidup, K. (2002).Who Am I .com: The Anonymous Domain Names on the Internet. Zingchong Rigphel, Vol II, 15-17. Nidup, K (2013). The Default Buddhist : Can science reinforce our metaphysical beliefs and positively transform our lives? RIM Newsletter, 12, 3-6. Nidup, K. (2013). ICT growth and usage in an organization, RIM Newsletter, 13, 2-9.